We call her Mama and put food out for her everyday. Mama is a big, long-haired, gray tabby cat who has become a regular in our backyard. I suppose she had strolled through many times before we even paid attention to her. There's an old dinghy-style sailboat upside down on a boat trailer by our back fence and it would easily provide protection from the elements and from prying eyes. What really brought Mama to my attention was something entirely unexpected. A large umbrella plant grows outside the picture window in our bathroom. It shields the lower part of the window from direct view and, since we can't put the mini blinds all the way down without crushing the potted plants on the windowsill, it helps to insure a complete visual barrier when we want privacy. The window sits directly over our bathtub, a wide, deep contraption that I have to step into to reach the mini blinds. One morning, standing in the bathtub and casually surveying our little kingdom, I noticed the umbrella plant rustling the tiniest bit. I could not see evidence of a breeze, and so I looked closer at the plant. I like to watch the lizards and tree frogs that frequent our yard and expected to see either a large green anole or a small green tree frog hopping around the bush. Nothing seemed to be there. Intrigued, I hunkered up to the window and craned my neck to look down towards the ground. To my utter amazement, I found myself looking into a nest of newborn kittens being watched carefully by our occasional visitor, the fluffy gray tabby cat. Mama, who had at that moment acquired her name, stared at me balefully, as if her look alone would keep me away. It wouldn't. Aside: I love cats and I love kittens even more. My very first "only mine" pet was a kitten some farm friends from Larimore, North Dakota gave me when I was 9. The kitten really should have been left with her mom longer, but I fed her and cared for her and, eventually, she gifted me with kittens. My dad had little tolerance for cats, and the kittens were given away as soon as they were weaned. Mom went too, although I was allowed to keep one male kitten for my own. 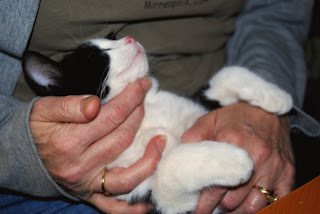 That made me happy enough - he was a kitten, after all. Unfortunately, the poor thing got distemper and died right outside my bedroom window within a few months. I never had another cat until I got my first apartment in 1969. As I said, I could not resist taking a closer look at the litter in my umbrella plant, and I also thought Mama might need food, so I took her a dish of wet cat food and kept my distance while I watched the kittens squirm and listened to their squeaky mews. There were five of them, and I relished the thought of five playful kittens romping in my back yard. The next day, when I took more food out for Mama, they were all gone. All that Mama had left behind was a crushed spot at the base of my bush. I never saw those kittens again. And I didn't see Mama again for a long time either. We have two small ponds in our backyard which draw many creatures in search of water. We see squirrels, opossums, birds of all kinds, water snakes once in a while, lots of frogs, toads, and lizards, and cats. Once we found a large black lab in our pond up to his shoulders, just cooling off. I still don't know how he got into our yard! When Mama appeared again, it was at the pond. And she had two weaned kittens with her. This was long after the original batch I saw under the umbrella tree and must have been a new litter. She had brought them for water, but we made a habit of feeding strays who came through, so the three of them stayed awhile to enjoy the easy meals. Mama would always sit off to the side, letting the kittens scarf up the food until they had had their fill. Then she would come over and eat her fill. This went on for a week or two, then we noticed that the kittens weren't always there. They stayed away longer and longer and soon stopped coming altogether. Mama kept coming though. To us, she became our "outside" cat; to her, we had no use except to serve dinner. Mama remained so wary of us that we soon concluded she was actually feral and not a pet tossed out or lost. She would wait on the patio for us to notice her and bring her food out, but as soon as we opened the door, she would retreat ten or twenty feet, then wait until we went back inside before venturing to the meal. Michael and I made it a habit to talk to her whenever we saw her in the yard, trying to acclimate her to our voices and our presence. We succeeded enough that she became a daily visitor. When we suddenly had lots of cat visitors in a few days, we suspected that Mama was in heat again. We began to think about having her spayed, but really didn't know how to get the job done when she was so scared and cautious. Soon enough, the vistors disappeared and we resumed our normal routine. One morning, as I made my bed, I saw Mama in the side yard stretched out on the grass. Next to her a kitten of probably 6 weeks played by itself, ambushing stalks of grass, bugs, and Mama's tail in no particular order. 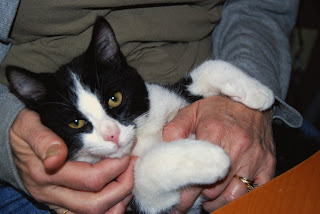 A "tuxedo" cat, the kitten had longish, black and white fur and looked just like a neighbors' cat. The neighbors did not particularly like cats, but their daughter had adopted this one as a little girl and was so persistent about "Black and White" being her cat, that her parents eventually let her feed him. But he wasn't an inside cat and he didn't merit veterinary visits or neutering. No surprise Mama's baby looked just like him! Mama came by everyday for meals, but Baby had disappeared. I took to spying on Mama, trying to figure out where she might have Baby stashed so I could tame it enough to get it adopted and also take it out of the reproductive cycle that had produced it. After many weeks, Baby did start coming along with Mama for meals, although it didn't eat kibble yet. While Mama ate, we watched the kitten play delightfully on our patio. Michael remembered his laser pointer and began a regular ritual of playing chase games with Baby through the window of our back door. At night, the laser showed up all the way across the yard and seemed to convince Baby of it prey-ness with no trouble at all. It did not take long before Baby came looking for his "friend" the red dot in the evenings. But only the red dot - Baby fled in terror if it caught even a glimpse of a human being through the window. Try as we might, we could not get Baby to stay even as near as Mama when we brought food out. Nevertheless, we kept up our soft-talking routine and always tried to be slow and careful with our movements. Once or twice I pretended to go back inside and stayed near the food, but out of sight. Baby inadvertently gamboled within two feet of me more than once, with predictable consequences as soon as he saw me. By this time, Baby was eating kibble, too. And, as before, Mama would wait for Baby to eat his fill before stepping up to the dish for her own meal. The weather got cold and I began to worry about their protection, so I put a a large plastic bucket on its side, covered two-thirds of the opening with plastic sheeting, filled with large pieces of Michael's old, cut-up terry cloth robe, and began feeding them in the open part of the bucket. While Mama eschewed the offered bed, I did see Baby in there more than once on cold December days. Which brings us practically current. Around Christmas time, Mama disappeared for several days. Baby came for food and to look for Mama. Its plaintive mewing really got to me and I began wracking my brain for ways to nab Baby while Mama was gone. On December 26th, I sat on the floor, hidden behind my back door, which I opened just enough to poke a toy on a stick through. I figured that after our many evenings of red-dot games, Baby would not be afraid of a toy. It seems I was right. For an hour or so, I played with Baby from behind the door, offering the occasional treat and, when it seemed to like that, put a bit of canned cat food on the door sill. Cautious at first, Baby soon became curious enough to stick its head into our house. As soon as it saw me, of course, Baby hightailed back outside, but I deemed the adventure as success and planned to do it again the next evening. December 27th brought us some of our coldest weather of the season. We had guests to celebrate Michael's birthday (the next day), so I didn't have a lot of time to think about Baby, but after our friends left, I resumed my position behind the back door, albeit somewhat colder that night than the previous! I played with Baby and fed Baby for about an hour before it walked right into our house! I scooped it up and began my taming campaign on the spot. Since our guest bathroom had a sliding door shower enclosure, we put Baby up there, bringing in the bathrobe rags from the bucket-house and even warming them up in the dryer for Baby's comfort. In went food, water, and a makeshift litter box. I also found some toys to keep Baby occupied in our absence. Baby has been inside ever since. "It" turned out to be "he" and "Baby" became "Smudge" because of the black spot on his pink nose that seemed like it should wipe off but wouldn't. I spent every possible moment snuggling Smudge and found, to my delight, that this scaredy-cat did not seemed scared of me. He slept in my arms and sometimes crawled into the sleeves of my over sized sweat-shirt shrug. The vet suggested that he might be more active when he felt better. That certainly proved to be true! Smudge and I will have our one-month anniversary in a few days. He is a ball of fire now that he feels good, and he is a joy to play with and to cuddle. Jack and Trixie still don't like him, although Jack has decided that he might like to play a little after all and I foresee tolerance, if not friendship, around the corner. Smudge graduated from the bathroom unless supervised after he had his course of antibiotics. To give him a leg up against the big cats, I put up a kitty skyscraper that had been in storage for a while because neither Jack nor Trixie would deign to climb on it. Smudge loves his tower. The big cats can't get his food or his toys or him. He is adept at flinging himself from our bed onto the skyscraper and sticking, a very handy skill when all four pounds of you has just pounced on a sleeping, eighteen-pound cat's tail! Best of all, Smudge has adopted me as his new mom. He purrs like a turbo-charged car whenever I pick him up. He likes to snuggle up on my lap. He really likes to play games with me. And, amazingly to me, he loves my computer. Smudge sits on my lap and watches the cursor (or whatever else is moving) intently. Sometimes he tries to catch it, but mostly, Smudge contents himself with close observation of the monitor. When he gets bored, he sleeps on my lap. When he gets restless, he tries to eat my hands while I try to type. We are working things out pretty well. Here are some photos of Smudge in my lap. Until Michael showed up with the camera, Smudge had alternated between raptly watching the monitor and blissing out while I scratched his throat. The camera proved too diverting, though, and drew his attention away. If you don't think Smudge is the cutest cat ever, there is something wrong with you!! Notice the little black spot on Smudge's nose. Don't you just want to get a towel and wipe it off? BTW, we haven't forgotten Mama. She came back three or four days after leaving Smudge to his own devises. Obviously, she thought it was time for him to move along so she could start housekeeping with that black and white tomcat again. We plan to get a live trap this coming week and take her in for neutering, then return her to our back yard to live. We are happy to have Mama as a feral friend, but I can't take in any more kittens. This story should be sent to a magazine - maybe Cat Fancy, or any pet-friendly venue. I KNOW this story, and was fascinated with it. Imagine the people who haven't heard it before! !And I just want to take a tissue to that little nose!